The Ebola epidemic continues to spread through the Democratic Republic of Congo (DRC)’s North Kivu province. The newest areas to be affected include the city of Butembo and a number of isolated areas that are hard to reach. So far, 440 people have been infected with the virus, 255 of whom have died. 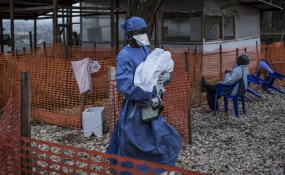 Teams from international medical organization Doctors Without Borders (MSF) continue to strengthen their efforts to help bring the epidemic under control.